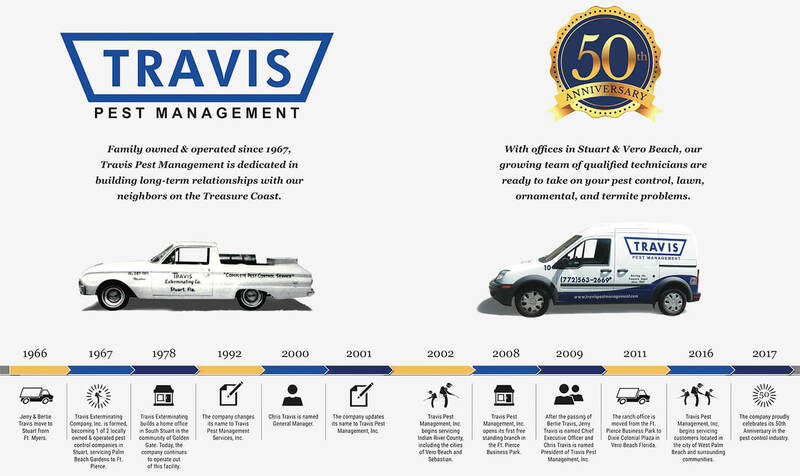 Travis Pest Management was founded in 1967 by Gerald P. Travis. Today, we are still family-owned and operated, proudly serving our neighbors on the Treasure Coast and Northern Palm Beach County. We have a vested interest in providing environmentally-conscious solutions to your pest problems, which is why our services are based on the principle of Integrated Pest Management (IPM). IPM is an effective approach to pest management which relies on education, waste management, home maintenance, biological and mechanical controls, and finally pesticide treatments. We will work with you to find the best solution to meet your needs. With offices in Stuart and Vero Beach, we are able to provide prompt pest control service to our residential and commercial customers. We offer a wide variety of services, including pest control, lawn fertilization, ornamental treatments and subterranean termite control. We also have extensive experience in treating for rodents, bed bugs, fire ants, bees, yellow jackets, and hornets. 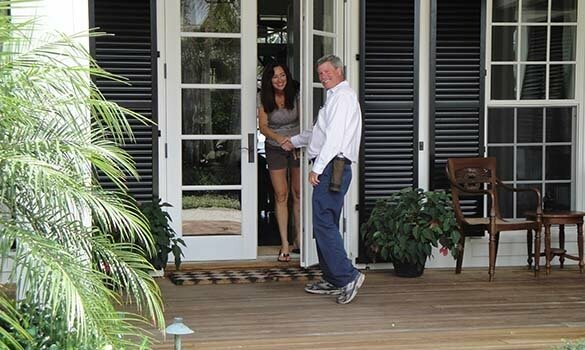 We attribute our success to our loyal clients and hope that you will join our growing family of satisfied customers. The mission of Travis Pest Management, Inc. has always been to provide our customers with the highest quality and most professional services available, while keeping in mind at all times that it is our responsibility to safeguard you, your home and the environment. In an industry where all companies have access to the same products and tools, we understand that our employees are what set us apart from the competition. We are committed to both our customers and our employees. It is this commitment that requires Travis Pest Management to hire only individuals with the highest integrity and moral standards. Our employees receive up-to-date training which allows them to provide you with the highest quality services available. The most important part of treating pests is to know exactly what pests we’re dealing with. Our continually-trained and experienced team inspects for nesting habits, signs of breeding, migration habits and other signs of pest infiltration before suggesting a treatment.